We get really excited around here when the salmon start to show up in summer & fall. We fish for coho from the kayak or beach and either troll for them (using bucktail flies) or cast (using clousers). This assortment of coho bucktails gets you 2 of each (8) color. 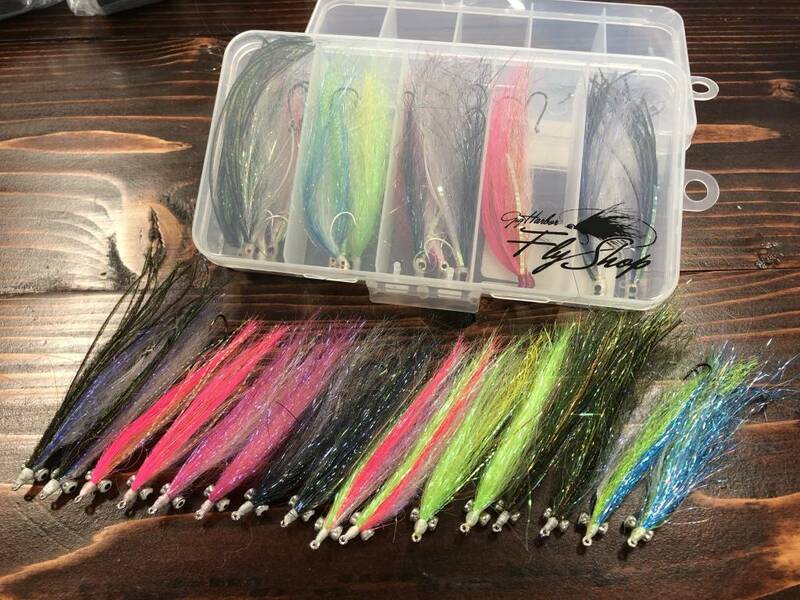 Pictured out of the box are clousers w/ weighted eyes. In the box (which comes with your order) are bucktails. They are the same colors as the clousers, but come set with two hooks. A front hook to help keel the fly when trolled and a back stinger hook to help with the hook up ratio. We usually troll bucktails on a Rio Striper 300 on an 8 weight or a Rio Outbound Short S6.